God meets us where we are in life and so it is with Designing Life Classes. It doesn’t matter where you are on your faith journey, Design House Co. is here to help and serve through the love of Christ. Designing Life Classes are meant to have a teacher and individuals who want to learn God’s word (Acts 8:30-31). Each session builds upon the previous session using art and design so individuals retain and gain a deeper understanding of the scriptures as it pertains to their life situation. Classes and workshops are available seasonally and upon request. We use art application, hospitality, design and self-reflection activities to develop a deeper relationship with God and each other. While we are making art, we are also developing solid creative writing skills, understanding time management and building a learning community of women and girls who value who they are as they understand God's promises. If you or your daughter like "art in the park", then this event is for you! The purpose of Faith & Flip-Flops is to help young girls understand what it means to walk by faith, as soon as they have the ability to begin thinking and making decisions for themselves. 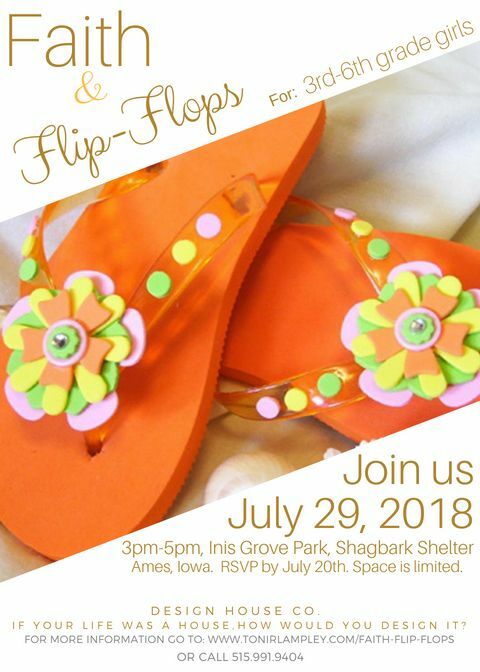 It doesn't matter if she is starting the 3rd grade or leaving the 6th grade, please join us for fun faith lessons using our flip-flop theme. Bring sunscreen, insect repellent, a Bible, and wear your flip-flops! Please RSVP by July 20th to 515-991-9404.